• Live View: View your web pages under real-world browser conditions with the new Live View in Dreamweaver - while still retaining direct access to the code. The new rendering mode, which uses the open source rendering engine WebKit, displays your designs like a standards-based browser. • CSS best practices: The Property inspector's new CSS tab shows the styles for the current selection as well as all the applicable CSS rules. Hover over any property to view a tool tip with jargon-free English explanations of CSS principles. New CSS rules can be created and applied in the Property inspector panel and stored in the same document or an external style sheet. • HTML data sets: With HTML data sets functionality, you can create your data in a standard HTML table, a series of div tags, or even an unordered list and then choose Insert > Spry > Spry Data Set to integrate that data into a dynamic table on the page with sortable columns, a master-detail layout, or other sophisticated displays. • Photoshop Smart Objects: Photoshop and Dreamweaver integration has evolved to the next level of compatibility and functionality. 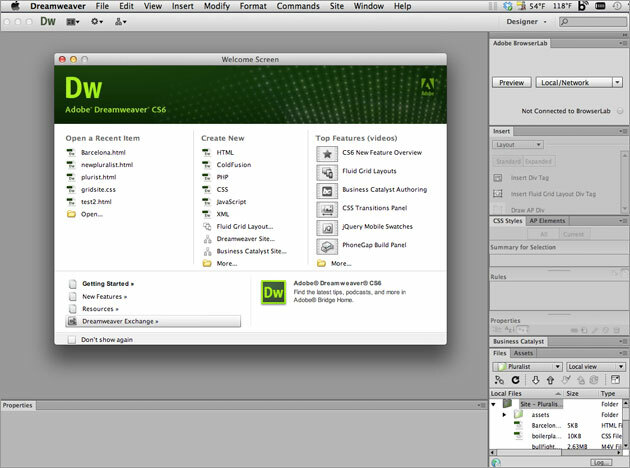 Drag and drop an Adobe Photoshop PSD file into a Dreamweaver page to create an image Smart Object. • Subversion integration: Dreamweaver integrates Subversion software for a more robust check-in/check-out experience with file versioning, rollback, and more. Once you've defined Subversion as your version control system, you can update your site to get the latest versions of its pages directly from within Dreamweaver; no third-party utility or command-line interface is required. • New user interface: Work faster and smarter across Dreamweaver and other components of the next version of Adobe Creative Suite thanks to a new level of integration and common user interface elements. • Fluid Grid Layout: Create cross-platform and cross-browser-compatible web designs using the CSS3-based Fluid Grid Layout system. Work faster and more efficiently as you develop projects using clean, industry-standard code for a wide range of devices and computers. Visually construct complex web designs and page layouts without getting buried in code. • Improved FTP performance: Save time uploading larger files with the reengineered multithreaded FTP transfer tool. Upload site files faster and more efficiently to speed production time. • Adobe Business Catalyst integration: Use the integrated Business Catalyst panel in Dreamweaver to connect and edit sites you build with Adobe Business Catalyst (available separately). Build e-commerce sites with the hosted solution. • Enhanced jQuery Mobile support: Build native mobile apps for iOS and Android platforms using updated support for jQuery Mobile. Build apps to reach mobile audiences while streamlining your mobile development workflow. • Updated PhoneGap support: Updated support for Adobe PhoneGap makes it easier to build and package native apps for Android and iOS. Create mobile apps by repurposing existing HTML code. Use PhoneGap emulators to check your designs. • CSS3 transitions: Animate changes to CSS properties as transitions to bring web designs to life. Maintain greater control of web design as you finesse page elements and create captivating effects. • Updated Live View: Test pages before publishing using updated Live View functionality. Live View now uses the latest version of the WebKit rendering engine to provide the ultimate in HTML5 support. • Updated Multiscreen Preview panel: Check the display of projects built for smartphones, tablets, and desktops with the updated Multiscreen Preview panel. This enhanced panel now enables you to check rendering of HTML5 content.